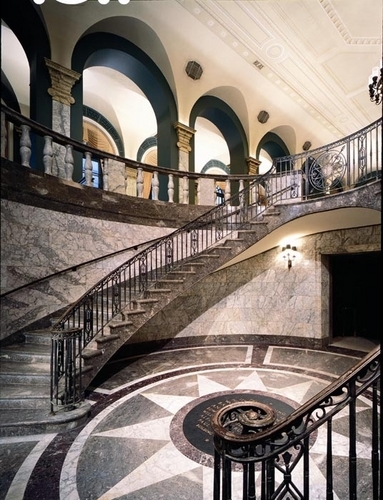 Don’t be surprised that “Scandal!” (on view through April 2011) has gotten more attention lately than the permanent exhibits at the Museum of American Finance. It’s fun to see Charles Ponzi, Enron, Bernard Madoff, and other bad actors in the financial world take it on the chin. How can you not chuckle over Lehman Brothers “deal toys” — lucite paperweights that celebrated killer deals (oh, the hubris!)? Besides, it’s good to see displays that finally clarify what these scandals were all about. But to a certain extent, the permanent exhibits in this monument to capitalism at 44 Wall Street (soaring ceilings, massive chandeliers, Italian marble) are also about crooks. So much of what we take for granted in our financial transactions derives from the need to stop bad guys from bollixing things up. Enter the “Money: A History” gallery, and you see displays of early American paper money, bills that look so amateurish, you’d think anyone could counterfeit them. And you’d be right. Even after Alexander Hamilton, the first Secretary of the Treasury, created the National Bank and the U.S. Mint, banks and states continued to issue their own notes, so counterfeiters had a field day. After all, who could keep track of which bills were or weren’t real? Sometimes the counterfeiters just doctored up real money, and occasionally they made really dumb mistakes. For example, a note presumably issued by the Stone Canal Bank says “STONECANAL,” with no space between the two words. Now, you may not see this particular note when you visit the museum, because the documents in the permanent exhibit are rotated for the sake of preservation. But you will see something like it, and you might find yourself admiring the counterfeiters’ perseverance. The banks and states kept coming up with different colored inks and elaborate allegorical figures, yet the counterfeiters never gave up. By the 1860s, when the U.S. Government finally insisted upon a national currency, one third to one half of the bills in circulation were fakes. And today? 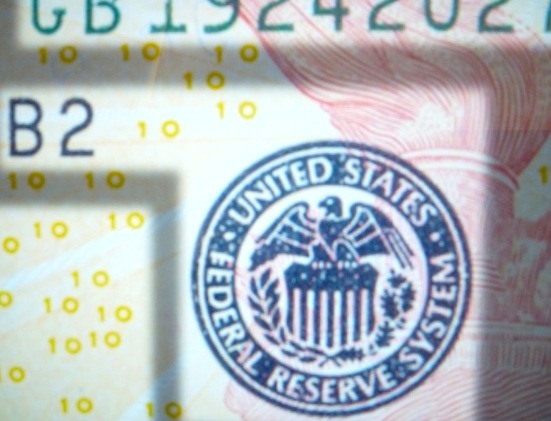 A large touchscreen allows visitors to zoom in on the details in a modern Federal Reserve bill. I’m forever surprised by how many dots and intricacies (above) are tucked into those depictions of the American eagle, the White House, and the founding fathers. Clearly, counterfeiting is no longer a stress-free career. But I do wish Andrew Jackson’s forehead would stop getting bigger. Also in the money room is a light box where you can check for watermarks and security threads on your own bills. I pull a Jackson out of my wallet and check it on the light box. What a relief; I am solvent. Even you and I might have been good enough to counterfeit some of the early stock certificates I’ve seen in the “Financial Markets” gallery. So in the 1830s, the New York Stock Exchange mandated that every certificate on the NYSE had to have an illustration of at least one human figure. Counterfeiters now had to draw cherubs and noble Roman women. 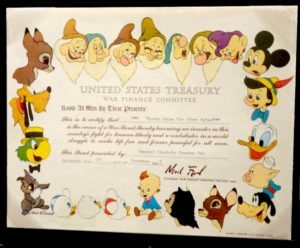 Corporations started putting elaborate scenes on their certificates, too, which not only stymied counterfeiters, but improved the company’s image. For example, the Chrysolite Silver Mining Company depicts a mine with capacious, 20-foot high ceilings, a comfortable, airy space where we’d all be happy to work. These scenes were made by skilled artists etching steel blocks in reverse, which presented yet another challenge to crooks. Some corporations issued extra-large certificates, too, in part because the bigger the document, the more hard-to-copy details they could fit on it. I find myself admiring both the artistry and the public relations cleverness of a West Shore Railroad Company certificate: It shows boats on the Hudson River, but the railroad itself is tucked discreetly into the scene on the right-hand side of the document. Don’t worry, the illustration seems say, the railroads won’t take over our landscape. 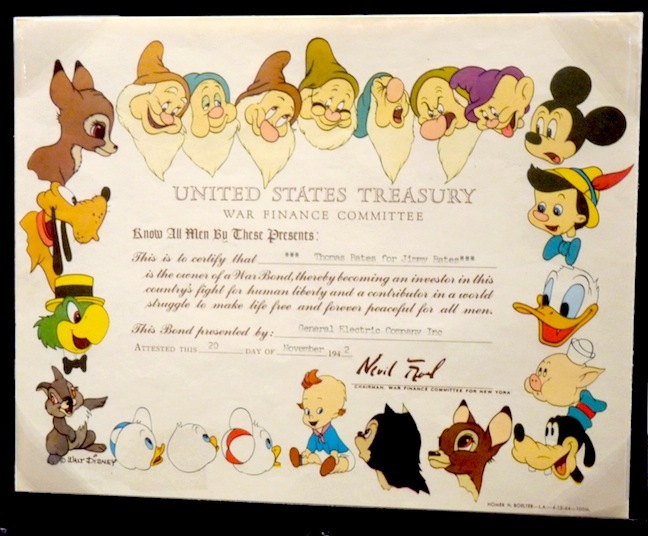 Among the evocative display of World War I and II bonds and bond posters, there’s a 1945 war bond with its perimeter ringed by Disney characters (above). Mickey and Donald and Goofy are represented, as are Snow White’s dwarf friends, but war is apparently man’s business, because Snow White herself doesn’t appear. If there really is honor among thieves, a good counterfeiter could have corrected that bit of sexism. ED WETSCHLER, Associate editor of Everett Potter’s Travel Report, has written for The New York Times, Delta Sky, Caribbean Travel & Life, the Official Pennsylvania Guide, and other print and new media. He is president of the New York Travel Writers Association and former editor-in-chief of Diversion magazine. In a previous life he played backup piano for bands like Jay and the Americans. I’m new to this site. There are so many good stories here! I have never hiked in England, but I want to now. I also want to see this Finance museum the next time I go down to New York City. The blog made me put a Canadian bill under a strong light!